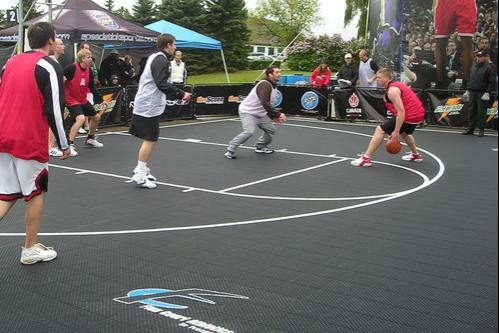 Flex Court is an excellent choice for basketball court flooring in Long Island, New York. We specialize in basketball court installations but also have extensive experience in building other sports surfaces including tennis courts. We offer safe, durable high-quality courts for every yard and budget, creating beautiful memories and fostering talent. 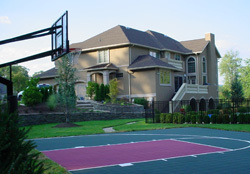 Our basketball courts are fully customizable and are available for all project types, from prestigious tournaments to private residence court surfaces. Flex Court offers a variety of surfacing options from high-end, professional facilities to a backyard court that is ideal for both indoor and outdoor applications. We work with top-of-the-line manufacturers of floor coverings. The basketball court for a school or recreational facility can be one of the most challenging surfaces to design, as the courts are used for multiple applications, not just basketball. Therefore, you need to work with professionals that understand these challenges and work with you to design a surface tailored to meet your needs and budget. At Flex Court, we are committed to achieving your vision for flooring wants and needs by exploring all the surface options available to build the basketball court you want. We will meet with you to discuss and better understand what you're looking for to help accomplish your exact vision with high precision. At Flex Court, we are confident that with our strong basketball court system design and installation experience, along with our exceptional customer service and professionalism, you will be highly satisfied with the result. Entrust us with the job, and count on us to create a court that will make your facility/sports complex unique. If you are interested in setting up a commercial basketball court for your Long Island facility, contact us today for an estimate. For any questions or more information, speak to one of our customer representatives to learn more about our sport flooring products, services, and capabilities. We are glad to help you bring out the best of the game.